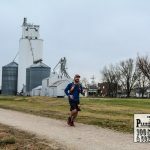 I already covered how I tested what not to do the day before a marathon, so here is the recap of the result. Always enjoy this race course! 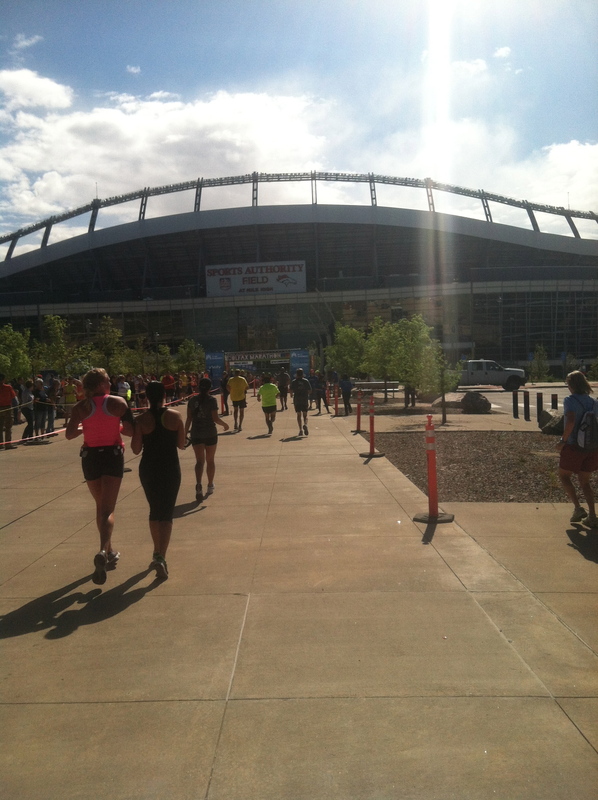 From running along the Platte River to through Mile High Stadium (twice! ), the crowd and volunteers are amazing. 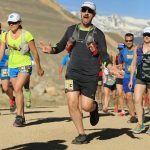 This year I had the honor of being part of the race Ambassador Team which made it even more memorable. 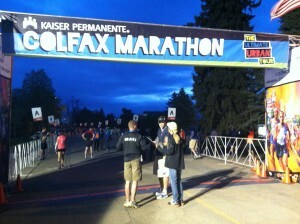 I arrived at the starting line about an hour before start and ran into a fellow Colfax Ambassador. Running has allowed me to meet some amazing people that are willing to set aside what others call crazy and push their limits. This includes someone that I happened to sit next to on a plane over a year ago. We started talking and found out she was doing her first 10k soon. 9 months later her and husband moved to Denver and here she is doing her first marathon! Not only first marathon, but in Denver at a mile above sea level. Much impressed! As I made my way to the corral, I ran into George. 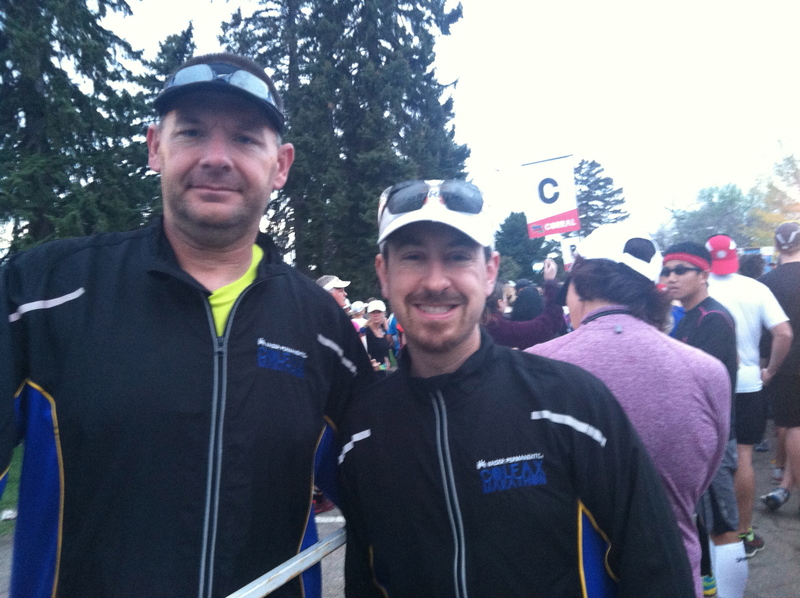 I ran with him for his very first marathon last fall and he was back to complete another. We chatted for a bit about goals, how the wives were doing with the kids while we ran the streets, and good lucks. Keep running! You never know who you will inspire! All true. Plus, you may even inspire yourself to do more. I was happy to again hear that Jake Schroeder, lead singer of the band Opie Gone Bad, was singing the National Anthem. After that, Andrea Dowdy (CEO of the races), announced she had received a call from Boston Marathon Race Director Dave McGillivray saying to have a great event. 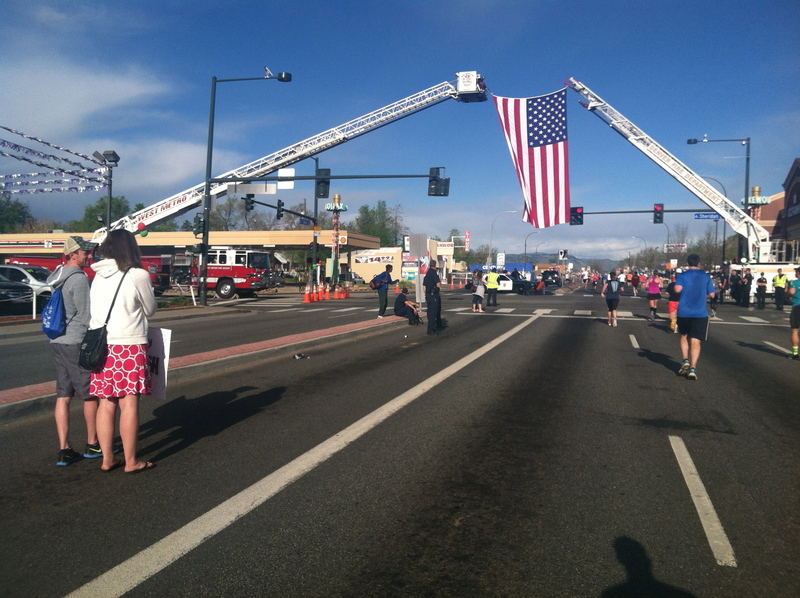 We all took a moment of silence to remember those impacted by the bombings at the Boston Marathon. With that, it was time to run! It wasn’t more than 6 minutes until my wave crossed the starting line. Off and running around the park. A little sad that the half marathoners get to run through the zoo and we don’t, but we get Mile High Stadium. Twice! After 3 miles I had already made some friends on the course. Chatted about shoes, the weather, and what we were going to eat at the finish line. That BBQ is always a great motivator! 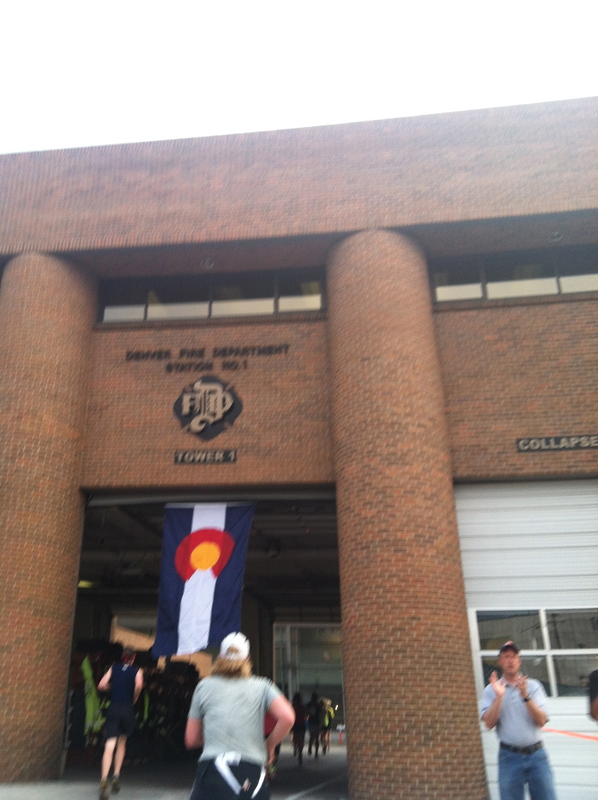 Running through the fire station is always fun … and quick. If you don’t have a camera ready, you will miss it. Giving high fives to the fireman and firewomen while hearing the echo inside the station carries you right through. 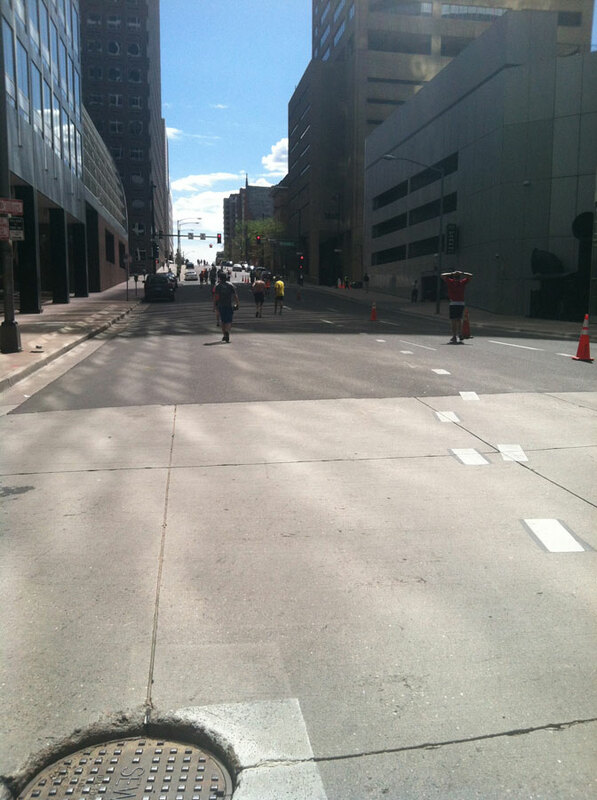 After that, cross the road and run along the Platte River Trail. The path is about 3 people wide and I was still wearing my jacket. Weather was still partly cloudy with a nice breeze. After a couple miles on the path, along came Mile High Stadium … home of the Denver Broncos! 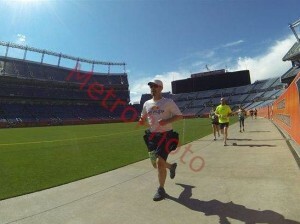 So much fun running through the stadium! The tunnel leading out to the field is especially enjoyable as for just a moment, you can imagine suiting up and running out on the field for a game. It’s a view that many don’t get to experience. They always have music blaring over the loudspeakers to keep you going! 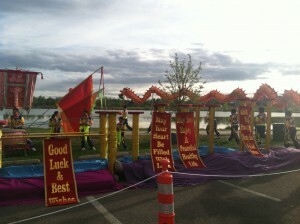 At the Sloan’s Lake entrance, the Dragon Boat Festival was going on. This included drums and dancing dragons! Very cool to see it up close and see boats out on the lake as I ran around it. Each boat had about 12 rowers inside moving across the lake. 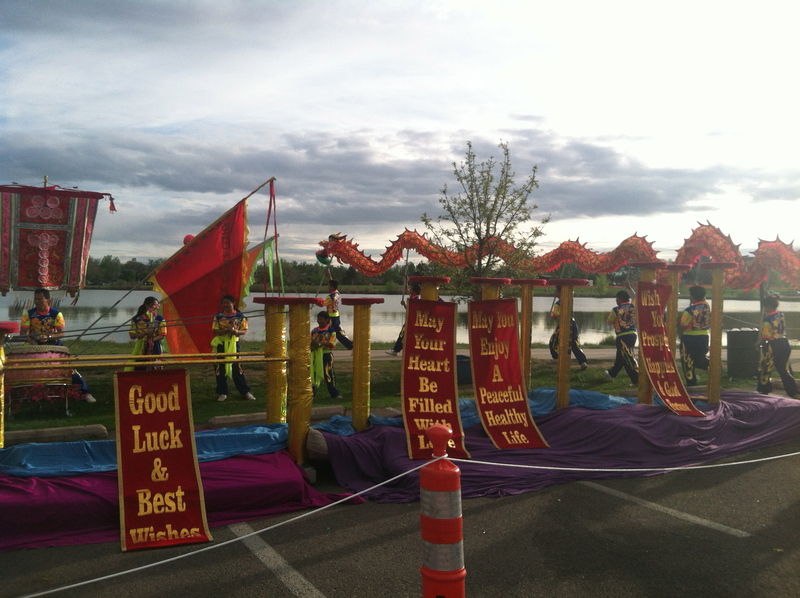 Bright colors, pulsing music, and energetic spectators … makings of a great course! Leaving the lake area was another relay station. That meant people with fresh legs would be flying by me shortly. Halfway point … 2:05 half marathon time. Wow I could get a PR today! Silly me. 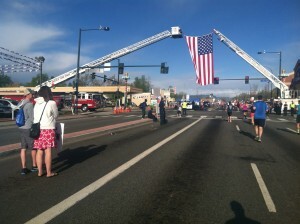 All that was left was to run down Colfax. Straight shot … could see the skyline. At this point, the sun started to poke through the clouds and the temperature was rising. Just keep moving forward. It’s all a slight downhill for 3-4 miles, so it should be easy right? Not always. Different leg group and if nutrition is off, then, well, you’re off. Fortunately, there are people all along the course. 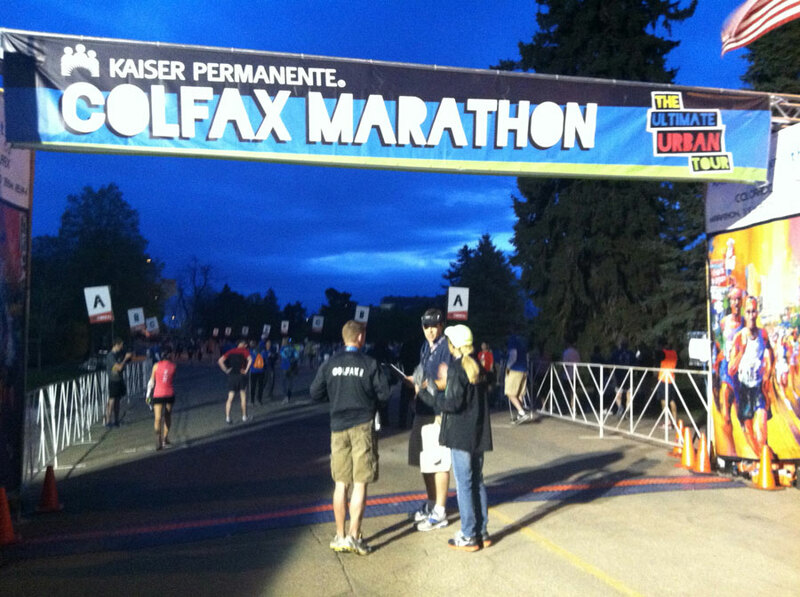 That is not the case for all marathons, but Colfax Marathon brings out a great crowd. Plus, local bands pop up every mile or so by surprise. I couldn’t tell you what songs they were playing, but having that rhythm is enough to keep me moving. Once to the end of the Colfax, take a left and head back to the stadium. This is the last relay transition and is a slight downhill. The water is handed out in fancy clear plastic cups. I have no idea why I notice that, but it’s just different. After 3 hours of paper Gatorade/Pepsi cups, now it’s hard clear plastic. I don’t care. 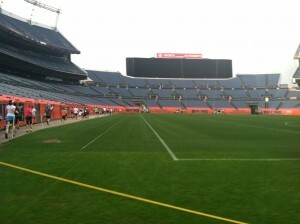 I get to run inside the stadium again! After the stadium, back on familiar territory for a couple miles on the Platte River Path. Then out of that and the slow incline up 17th. It’s not steep, but it’s long and you notice the incline. So of course psychologically you feel it. Then you get to the end of 17th Street. Me: No, I know what’s around the corner. This is crazy fun even if just starting out on the run. It feels like it comes out of nowhere because the rest of the course is pretty much flat. Seeing as I knew it was coming, I had some time to decide what I was going to do. I decided to walk the first quarter of the hill and then run to the top. What’s the worst that could happen? I would have to walk the flat part at the top? Well of course I’m not going to do that as I would just keep going. Oh the mind tricks we play. My brain new fully well that if I said we would just walk at the top that I wasn’t actually going to do that. Fortunately, my brain gets occupied with itself and doesn’t realize that we just ran the entire hill. I did stop to take a cup of water from a little kid. Karma. I’m not all that good at being serious. I do my best to say thank you to every officer at every intersection. For one, I am truly thankful they are there. Second, I’ll take as much karma as I can when running. Me: I was told you have the beer? Officer: Sorry, it’s in my car. Me: (pointing at a liquor store) is that open? Officer: Nope or I would have already visited. All followed by great laughs and words of encouragement. Gotta smile a bit if you want to enjoy life. At this point, it’s just a mile run around the park and across the finish line. 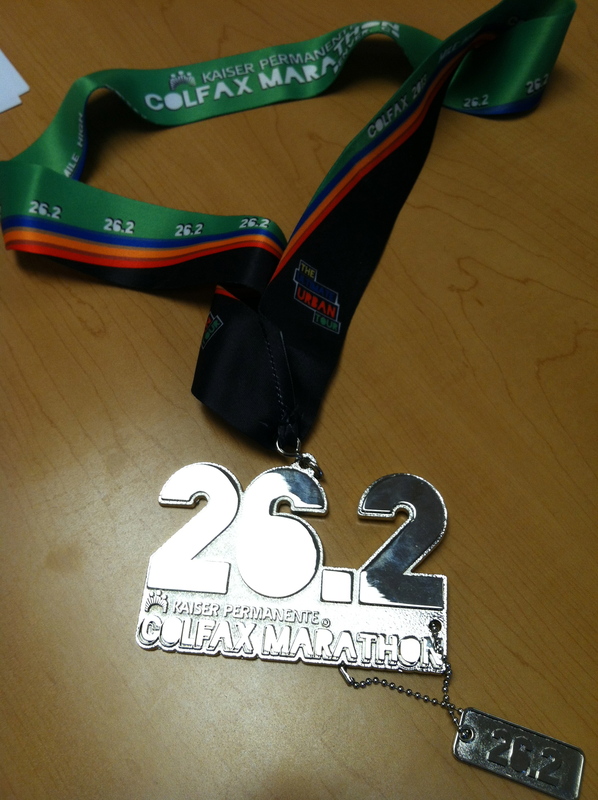 Picked up the pace, finished it strong, and grabbed my medal. By this point, the firefighters handing out the medals had their clothes on. That’s fine by me. Very sweet medal by the way! I really did intend on taking a photo of the Jim N’ Nicks BBQ. But I ate it too fast. Sorry. Overall, another great event and incredible people met throughout the experience! Time wasn’t exactly what I wanted, but still great training for ultras coming up in the next couple of months! Oh that mile 23 hill. I had read reviews and knew it was coming…but still wasn’t prepared for how my heart sank when I saw it! Looked at another woman and we both laughed and decided to just walk it and chat for a minute while we did. 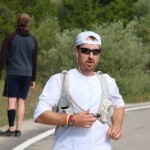 She said she had been pacing behind me for a bit and that it was her 40th birthday and her first marathon. I congratulated her on both. She said she was just so thrilled to be keeping up with somebody soooo much younger than her. I wish the hill and the altitude had let me laugh harder! That woman that thought I was so young made my day…I’m 38! Great job on finishing the marathon! Laughing makes the pain go away faster and continue moving forward. Never stop!